Scoliosis Shawl and Spinal Stole. Wrap around belt allows custom positioning of open area. No slip fabric nderneath keeps stole in position during imaging. 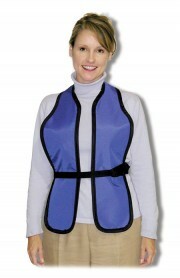 Allows for open area of the cervical, thoracic, and lumbar spine while protecting the breast area. 0.5mm Pb equivalency protection. Fast and easy to put on. Child: 6" wide x 20" from front neck.